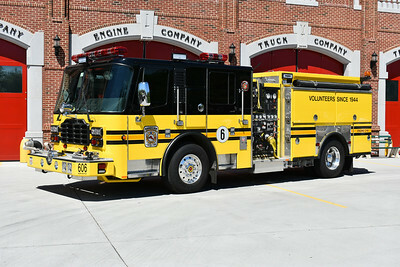 Ashburn Volunteer Fire and Rescue Department - Station 6. 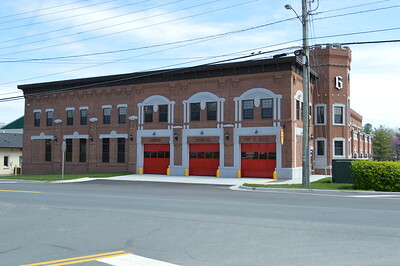 The new Ashburn Fire Station 6 opened on March 2, 2016. Another view of Ashburn's new Fire Station 6. These garages pull out to Ashburn Road and typically house the chief and command buggies. 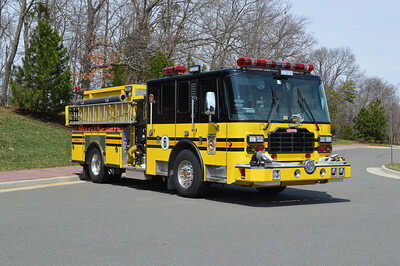 Engine 606 from Ashburn - a 2014 Ferrara Inferno 1500/500/20. 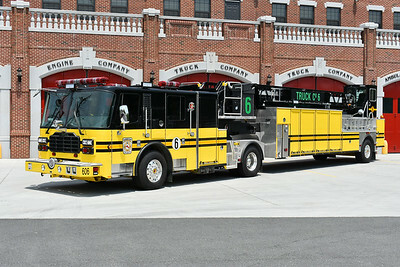 New to Ashburn is the black over yellow colors and Engine 606 and Engine 622 designed and built as "city" engines. 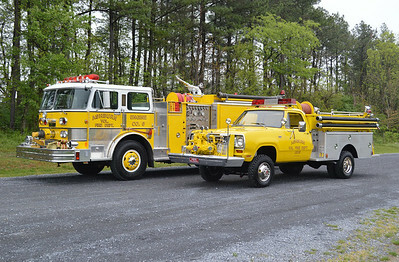 This photograph was taken in preparation for the media release from firereplicas.com that AVFRD's two new engines will be made into museum quality models. 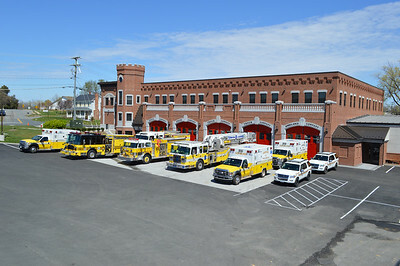 Not yet in service, in December of 2014 Engine 606 was brought over to Station 22 in Lansdowne for a group photo shot of the two new 2014 Ferrara Inferno's. Snow and sand were on the ground from a recent snowfall, however firereplicas.com needed a group shot for a media release of AVFRD's two new models. Engine 606 as photographed in April of 2015 for the introduction of AVFRD's 2014 Ferrara engines being made into quality models by firereplicas.com. 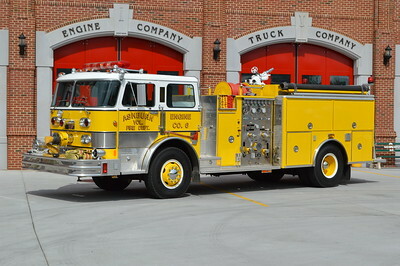 Engine 606 from Ashburn - a 2014 Ferrara Inferno 1500/500/20. 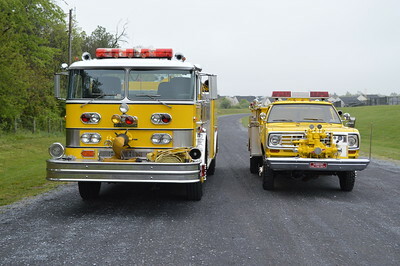 This photograph was taken in preparation for the media release from firereplicas.com that AVFRD's two new engines will be made into museum quality models. 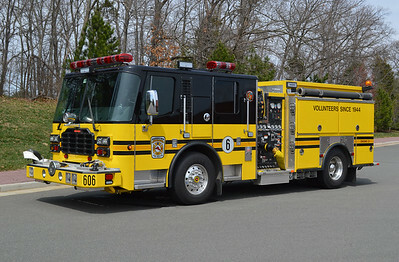 A rear end view of Ashburn's Engine 606 (2014 Ferrara Inferno) taken in April of 2015 near the Loudoun County apparatus shops in Ashburn. 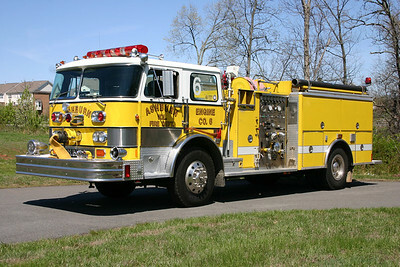 Ashburn's Engine 606B is one of four similar engine's built by Ferrara for Stations 6 and 22. Two were built in 2014, and two in 2016. Each station has a 2014 and 2016 model. Engine 606B is a 2016 Ferrara Ignitor 1500/500/20 with Ferrara serial number H5973. Its twin runs as Engine 622B from the Lansdowne station. 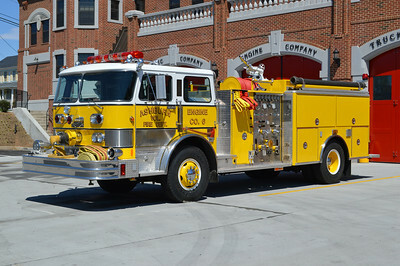 Ashburn's Engine 606C, a 2003 Spartan/Gladiator 1500/500/20. 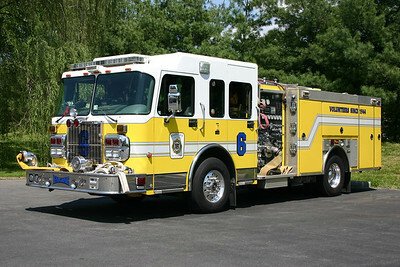 Former Engine 606 is a had a twin that was run at FS 22, that engine has been sold. Photographed in the parking lot of Fire Station 6. 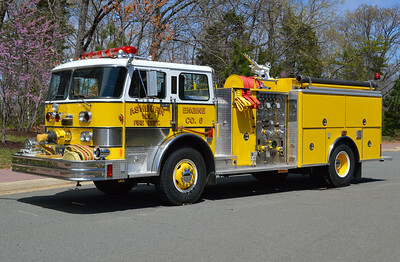 Just in time to celebrate the opening of the new Ashburn Volunteer Fire & Rescue Department Station 6 on March 2, 2016, this 1980 Hahn received an extensive restoration during the past several years. The Hahn was restored to its original look as much as possible. It does have a 1993 rehab which included a new body. In 1993, LSI of Purcellville, Virginia obtained the Hahn body just prior to the Hahn company ending and closing its doors. LSI added the front intake, upgraded lights, and did other work. Equipped with a 1000/600 and Hahn serial number HCP205810812. Ashburn's 1980 Hahn photographed in September of 2016. Another view of Ashburn's antique, a 1980 Hahn/1993 LSI/2015 rehab. 1000/600. 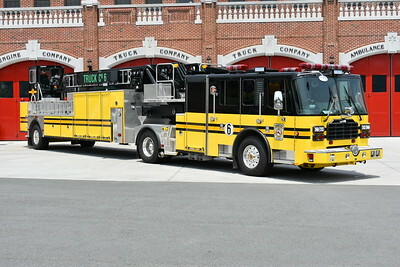 This was Ashburn's first custom engine and is currently used as a ceremonial truck. 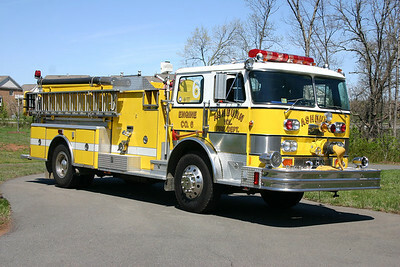 An officer side view of Ashburn's restored 1980 Hahn. 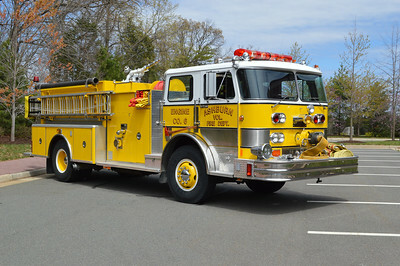 Ashburn's first custom fire truck was this 1980 Hahn 1000/500. In 1993, a new Hahn body was obtained from the Hahn company just prior to Hahn closing. LSI of Purcellville did the rehab work. LSI mounted the body, added a front intake, and upgraded the warning lights. The Hahn is still owned today by Ashburn and is used as a ceremonial truck, parades, etc. This photograph was taken at an Ashburn baseball park near Fire Station 23, where the Hahn was often kept. The officer side of Ashburn's 1980 Hahn. On a personal note, this Hahn is my favorite fire truck. 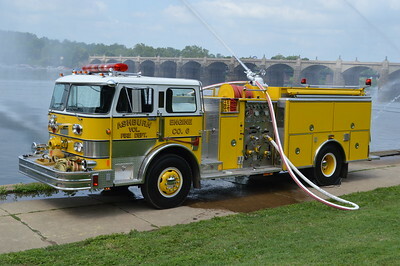 Ashburn's 1980 Hahn pumping along the river in Harrisburg, Pennsylvania during the July 2016 Pump Primers event. Apple Blossom 2016 provided the opportunity to photograph Ashburn's 1980 Hahn and 1974 Dodge/Stinebaugh together for the first time. 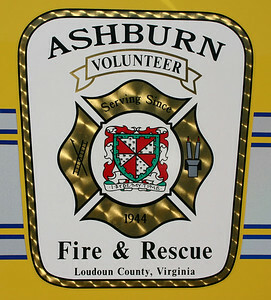 The Hahn is owned by the Ashburn Volunteer Fire & Rescue Department and the Dodge is privately owned. Another view of the Hahn and Dodge/Stinebaugh. 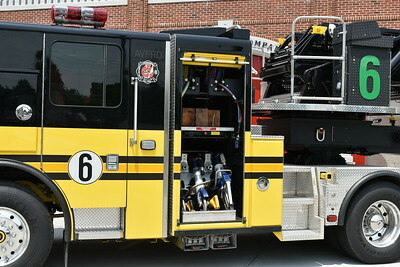 Ashburn's Truck 606, photographed in July of 2017 shortly after being delivered and the final lettering completed. 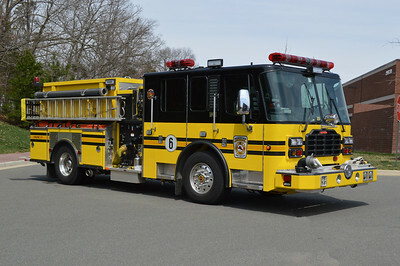 Truck 606 is a 2016 Ferrara Ignitor with a 100' tiller. It is Ferrara's first built tiller truck. The tiller replaces a 2001 Spartan Gladiator/2002 Smeal/2008 Ferrara 75' rearmount. 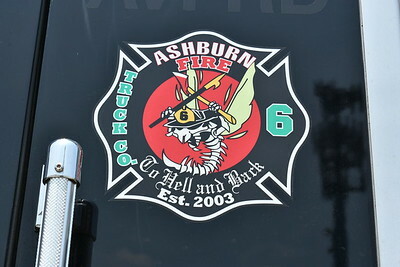 Truck 606 from Ashburn is also the department's extrication unit. Decal found on Truck 606, a 2016 Ferrara Ignitor 100'. 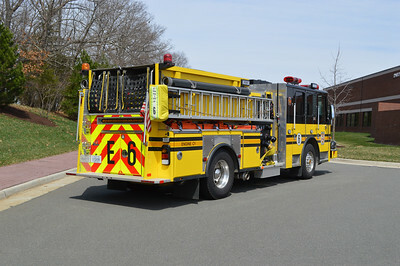 An officer side view of Ashburn's Truck 606, a 2016 Ferrara Ignitor 100' tiller. 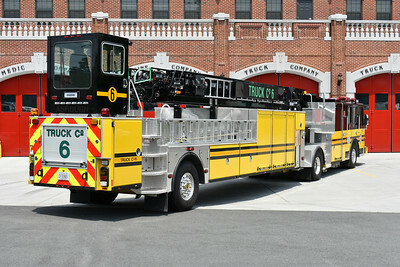 A back end view of Truck 606 from Ashburn, a 2016 Ferrara Ignitor 100' tiller.